Situated in Sandton, the business hub of South Africa, the chemical giant SASOL have constructed their new Head Office, which is replacing 17 of their former buildings around the Johannesburg area. Lighting Innovations Africa was tasked to provide an innovative and energy efficient lighting solution which included a full Light Management System. The ten story building has a planned occupancy of 3500 staff, mostly in an open plan environment taking into consideration staff comfort, the use of natural light, cost efficiency and a healthy working environment. For office, meeting rooms and common areas LIA provided 5800 pieces of the Allure LED light fitting which were locally manufactured in their Port Elizabeth factory. 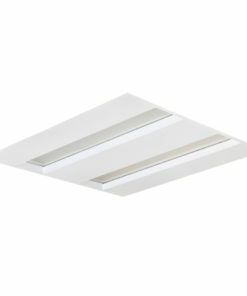 The Allure is a stylish perforated recessed fitting designed ideally for office illumination. The Light Management System used was ENCELIUM which is a DALI based system that enables full lighting control of the building and makes full use of Daylight Harvesting, Occupancy Control, Personal Control and Smart Time Scheduling which can deliver energy savings up 75%. The system consists of a Central service unit that enables the user to control the lighting by floor, zone or by individual fixtures. The fixtures, sensors and switches are all wired back to an Energy control unit (ECU) via the DALI bus. The ECU control the lighting using a combination of six strategies to save between 50 to 75%. The Polaris 3D is the graphical interface that view the building in 3D, providing various thermo graphic view’s to show status, energy consumption and all system information. Polaris 3D is web based and runs on Microsoft Silverlight. Each ECU is equipped with 4 DALI channels that enables it to control up to 256 fixtures and 256 sensors or switches.